"Leeks and potatoes are simmered with a ham bone, then pureed before cream is added to this subtle soup." In a large pot over medium heat, cook onions in butter until translucent. Stir in leeks, potatoes, water, thyme and the ham bone. Bring to a boil, then reduce heat, cover and simmer until potatoes are tender, 20 to 30 minutes. 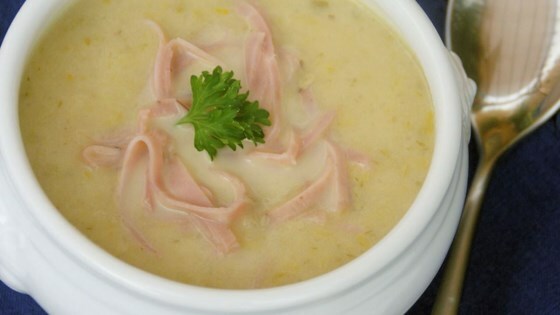 Remove ham bone and puree soup with a blender or food processor. Return to pot, stir in cream, salt and pepper, heat through and serve. See how to make a comforting, creamy potato and leek soup. Incredibly delicious.. I am in Germany where leeks are plentiful and cheap.. I tried this kind of soup at a german restaurant and wanted to duplicate the recipe and this one is very close. Too much butter not enough flavor. Mid-way through cooking, I had to add chicken broth and dill. It still wasn't very flavorful. Delicious! Used fat free half and half (instead of cream) and 1/4 cup butter to cut down on calories/fat.